“Megapolis” contains insightful interviews with Lewis Mumford, who was a prominent early figure in urban planning and the history of cities. Mumford predicted the expansion of cities into megalopolises in the 1930s in his book, The Culture of Cities, and in this episode reflects on how cities will continue to evolve. The episode also looks at Illinois-specific neighborhood development through an interview with architect Harry Weese. 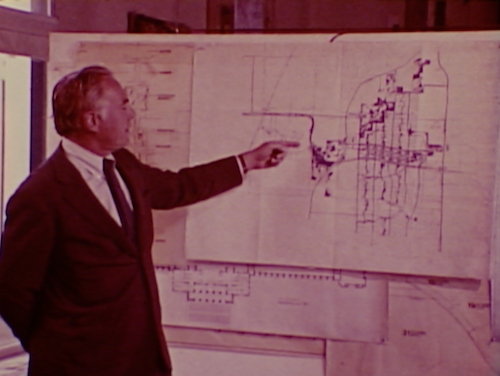 At that time, Weese was working on the design of Park Forest South, IL (today known as University Park). As Weese predicted for the community in 1972, “Park Forest South is not going to be an instant Paris, or anything of its kind, but it will be a community big enough to encompass many activities, including employment, education… it also provides for varying lifestyles and income groups.” (Any Park Forest South/University Park residents out there care to comment on this prediction?) Weese and the narrator put emphasis on the neighborhood’s innovative walkway system, which allows for pedestrians and bicyclists to travel without intersecting with major roads. Just as the “City Life” episode concludes with a plea for community participation, so does “Megapolis” implore viewers to take action. Architect Richard Saul Wurman (who later co-founded the TED conference) expresses his disdain for public inaction: “Apathy has destroyed the city more than wanton destruction. I mean, there has to be a change of attitude to save the city.” Ultimately, it is up to the citizens of the city to control the growth of our man-made environments. This Wednesday, March 26th, we’re celebrating Home Movie Day in Chicago’s Logan Square neighborhood. Per usual, we’re inviting the community to bring their celluloid home movies (16mm, 8mm and/or Super 8mm) to have them projected in front of a live audience. Don’t have any films? Don’t fret! We also have a program of CFA home movies in store (more on that soon). This is a very collaborative event all around. We were invited by The Post Family to help create and co-host the event. They’re a Chicago art collective with their own printmaking studio, office, and gallery space, and they’ve courageously taken over Comfort Station programming for the entire month of March (you can peek at their remaining events here). We’re also teaming up with Northwest Chicago Film Society, who will offer their wisdom & expertise by projecting these treasured celluloid films for all to see, and Logan Square International Film Series (Comfort Films), who continue to help spread the word. The Post Family has also enlisted the help of Synesthetic (Angel Elmore : piano, Joe Vajarsky : tenor saxophone, Norman Long : field recordings, Dan Godston : trumpet & Lou Ciccoteli : drums) to accompany any or all films. We’re using this community-fueled event as a good excuse to crack open our JoAnn Elam Collection, or more specifically, to showcase rarely screened 8mm home movies from the collection. 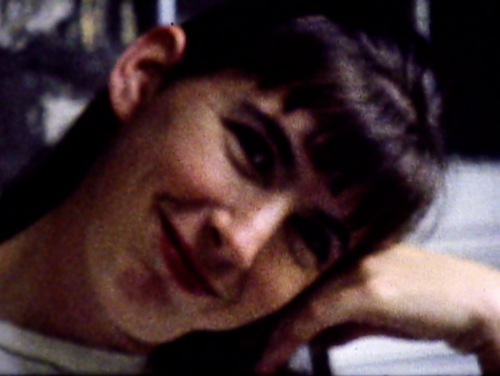 Just in case, some quick background: JoAnn Elam (1949-2009) is a central figure in the history of Chicago’s experimental film community. Her short experimental and documentary films capture the spirit and ethos of a politically active, feminist, and socially conscious artist. She also happened to be a Logan Square resident, often filming her neighbors, community events, gardens, co-workers & friends with her 8mm Carena Zoomex camera. Small gauge film (regular 8 and Super 8 ) is low cost, technically accessible, and appropriate for small scale viewing. Because it’s cheap and you can shoot a lot of film, filming can be flexible and spontaneous. Because the equipment is light and unobtrusive, the filming relationship can be immediate and personal. The appropriate viewing situation is a small space with a small number of people. Therefore it invites films made for or with specific audiences. Often the filmmaker and/or people filmed are present at a screening. The filming and viewing events can be considered as part of the editing process. Editing decisions can be made before, during, and after filming and can incorporate feedback from an audience. Connections can be made between production and consumption, filmmaker and audience and subject matter. Small gauge film is not larger than life, it’s part of life. The intimate Comfort Station Logan Square provides an “appropriate viewing situation” as well as a geographically meaningful space to screen JoAnn’s 8mm films. 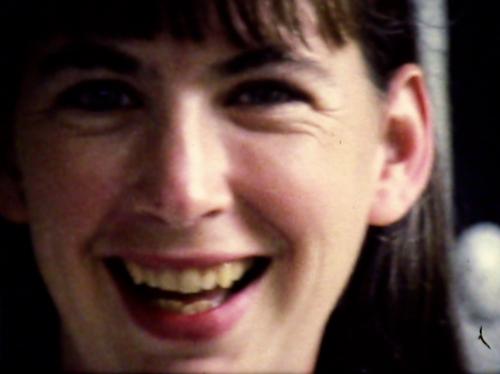 This Wednesday’s program isn’t a retrospective of JoAnn’s work, but rather a showcase of the Logan Square-centric home movies found in her collection. The selected films include scenes of Palmer Square Art Fairs, back porch lounging, a double exposed bbq and energetic black kittens. One reel, simply titled “Belden & Kimball,” documents smaller neighborhood moments – potted plants, parallel parking and youthful sidewalk shenanigans. 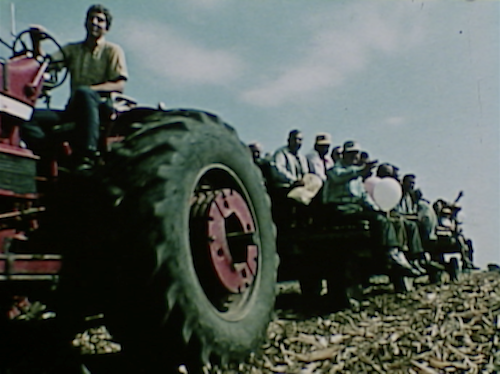 To compliment JoAnn’s films, we’ll also be screening very Chicago home movies from our other collections (primarily, the Rhodes Patterson Collection). These 16mm reels were all shot during or around the same time as JoAnn’s, but go beyond the neighborhood of Logan Square. Highlights include a shaky helicopter ride around the loop, a crowded lunch break at Grant Park, a trip down late 1970′s Maxwell Street Market and a panorama of Great America in 1977. Last week’s episode, “Greenbacks,” introduced the “external costs” tied into urban expansion, looking at how the real costs of development exceed the explicit dollar value. “Little Big Land” further explores this by visiting the rapidly disappearing farmlands and diminishing areas of nature. The growth of cities like Chicago and the expansion of the highway, while beneficial to a growing urban population, have also come at the cost of the landscape. The episode looks critically at land privatization, and warns that “if present trends continue, the urban blanket will be drawn indiscriminately across the landscape – house by house, shopping center by shopping center.” Some potential prevention strategies are introduced, including the idea of instituting a green belt. The challenges of balancing urban expansion and environmental preservation are further complicated by the increasing birth rate in the United States. The episode features a brief interview with Dennis Meadows, who had just recently published his co-authored study, The Limits to Growth. The study utilizes computer models and programming, plugging in a number of variables to examine the rate at which population will exceed production. Although the results found in The Limits of Growth have been somewhat polarizing, it is still interesting to see the ways in which computers were used for environmental predictions and calculations some forty years ago. 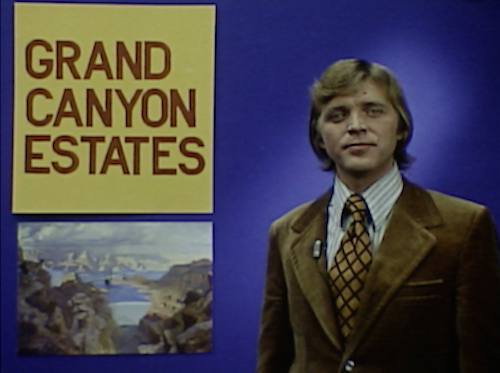 Second City’s David Rasche has a solution to the increasing demand for new urban developments: Grand Canyon Estates, which has transformed “a useless hole in the ground into the most unique community you’ll ever be fortunate enough to invest in.” The new development will feature the world’s deepest artificial lake, as well as the “largest collection of plastic vegetation ever assembled in one place.” It’s an exciting investment opportunity too good to pass up. Early in the episode, the narrator predicts that in the future, “Chicago will grow outward, as will Indianapolis, Gary, Milwaukee, forming one giant megapolitan region around Lake Michigan.” This introduction to the megalopolis serves as a nice segue into next week’s episode. Aside from the explicit financial cost, what is the true price of industrial production? Further, how are these costs transferred to the public? “Greenbacks” takes us to two sites to explore these various hidden (or “external”) costs. The first stop is America’s “carpet capital,” Dalton, GA. On the one hand, the influx of new industry that moved into Dalton after the Second World War can be seen as an economic boon. However, while the new factories provided many jobs for Dalton residents, the resulting air and water pollution created long-term environmental detriments – the Conasauga River and nearby Drowning Bear Creek have become so polluted that nothing can live in their waters. Although a secondary water treatment facility was constructed in Dalton as a response, the water cannot be truly pollution-free without a more expensive method of tertiary (advanced) water treatment. The price of tertiary treatment is only more expensive in the short term – without it, Dalton’s water supply remains polluted and the treatment facility is only a token to assuage local fears of water pollution. 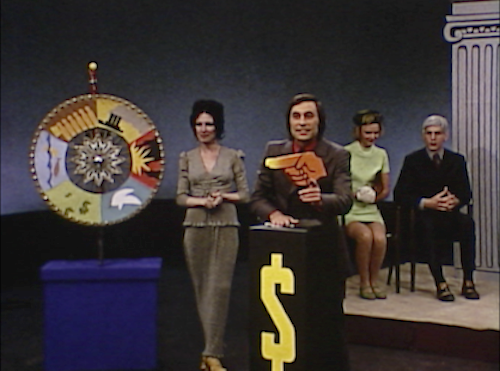 Finding a culprit for these environmental concerns often entails much finger-pointing and blame-shifting, a process satirized in the Second City game show sketch, Pass the Buck: the regular panelists are representatives from Government (Joe Flaherty), Management (Harold Ramis), and Labor (David Rasche). These three contestants face off against one another, as well as a representative of the public (Ann Ryerson), in trying to quickly create a scapegoat for hypothetical environmental problems. 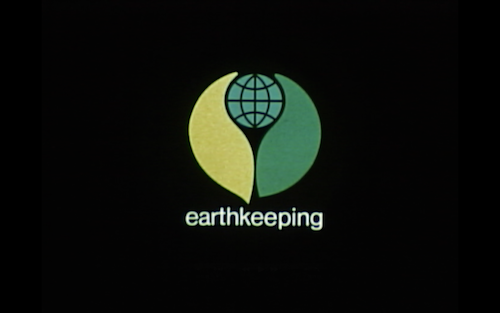 Over the next six weeks, CFA will be presenting episodes of Earthkeeping, a series produced in the early 1970s for WTTW that explores environmental, ecological and sociological issues. In presenting this series, we hope to reintroduce DeWitt Beall, a Chicago-based filmmaker primarily active in the 1960s and 70s. Although the footage in Earthkeeping is largely rooted in Chicago, the series also travels to other Midwest locations (and even makes a quick jaunt down to Dalton, GA in the “Greenbacks” episode). The series features interviews with prominent scholars from different fields, including economist Robert Heilbroner, ecologist Barry Commoner, and sociologist/urbanist Lewis Mumford. Additionally, the series utilizes topical interludes written and performed by members of the Second City, including the recently departed Harold Ramis and pre-SNL John Belushi. This gives us an opportunity to glimpse performances from these comedians that would go otherwise unseen. Just like network programming, we will upload and stream one episode of Earthkeeping per week for the next six weeks. Please feel free to share your thoughts and comments on the series below. The Foundation Years program was, regrettably, short-lived. In 2011, Chicago Magazine did an in-depth piece on the program, which can be read here. “City Life” focuses on the sociological consequences inherent in the rapid growth of urban landscapes. The episode first orients the viewer by explaining how city growth has transformed the concept of ‘community’: the transition from village life to city life has necessitated the development of neighborhoods, which are established in order to retain the same sense of community once found in the village. Without these new forms of community, the narrator asserts, the city would be nothing more than “…a collection of strangers; an anonymous and faceless place,” despite its size and population. Additionally, the narrator makes the claim that our cities “have been built for profit, not people,” and the episode employs two architectural examples to evidence this. The first is the Pruitt-Igoe housing project in St. Louis, MO, a thirty-six building development which is equated to a “prison for the poor.” The design of Pruitt-Igoe favored minimizing expenditure over benefiting its citizens – for example, designing the development without a single playground, despite the projected high number of children that would be living there. This idea of housing projects as a ‘prison’ is reinforced through interviews with urbanist Lewis Mumford and economist Robert Heilbroner. Both interviewees elaborate on the effect of large-scale migration from rural to urban environments: whereas the first generation to move to the city had family in the country to fall back on should things not work out financially, that is no longer the case for most impoverished city dwellers. Stay tuned next Monday (March 10th) for our next episode, “Greenbacks”….